How can I develop an appreciation for writing amongst my future students? As teachers you may notice that when you assign that traditional research paper in your classroom that you may lookout around to see all of your students looking like this. This look of pain and suffering coming from your students is most likely due to the monotonous rotation of research papers that your students are finding themselves stuck dealing with. 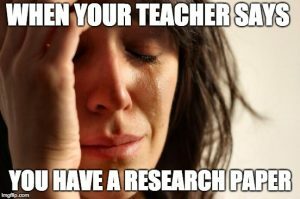 Though research papers may be beneficial and essential in some cases, the amount that you assign within your classroom should be kept to a minimum. There are so many other ways that you can lead your students to conduct various assignments that are equally, if not more, successful than having your students research a particular topic and demonstrate the knowledge that they have gained which will consequently result in a more enjoyable and memorable experience with writing.